I have a love-hate relationship with getting proof copies of cookbooks. On one hand, I like getting my hands on a book well before it's released to the public. On the other hand, when I get an uncorrected proof, I have limitations as far as what I can say about it. I can't quote anything, because text could change during the correction process. And I don't think it's fair to write about recipes for that reason. They could change, so any evaluation of a recipe would be unfair. I suppose it's also possible for a recipe to get deleted. I doubt it happens often, but with my luck I'd be telling you all about recipes I made that aren't even in the book any more. Photos aren't always in their finished state. I've gotten some proof copies that had black-and-white photos, and others had photos that had notes about cropping. And often the index is missing or incomplete. If one recipe references another one, those page numbers might not be there, so it can be a bit of a hunt to find the those referenced recipes. 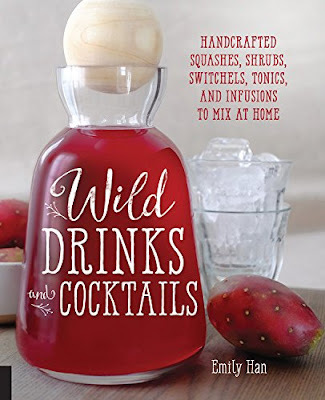 Right now I'm looking at an uncorrected proof of Wild Drinks and Cocktails by Emily Han. And I actually have a lot to say about it. Note: the book has been released, but I haven't seen the final version. While I have a few cocktail recipe books, this one has an interesting twist. When they're talking about "wild" recipes, they're not using it as a synonym of crazy ... they're talking about wild ingredients. Like needles or tips from certain evergreen trees, herbs, and fresh berries. But that doesn't mean you need to go foraging. Most of the things you'll need (except those evergreen needles) are readily available at your local grocery store. And while fresh herbs are no doubt preferred, the book mentions when dried herbs can be substituted. I have quite a few recipes bookmarked, including one that will have me trimming the spruce trees in front of my house. I also want to make orgeat. I've seen in used in cocktails, but I haven't found it for sale anywhere. Cherry bounce sounds like a lot of fun, too. There are also recipes for sweet and dry vermouth (wow, I never thought of making my own), gin (starting with vodka and herbs), bitters, flavored wines, liqueurs, and all sorts of other concoctions. Of course, there are cocktails I want to try, too, after I make the other ingredients. It's not all alcohol, though. There's also a recipe for making homemade ginger ale and several for making flavored fizzy sodas, flavored syrups, infusions, and non-alcoholic drinks like the cherry balsamic shrub that I'm planning on making. If you want to bring your cocktail-making to another level, I think you'll really like this book. I received the book from the publisher at no cost to me.